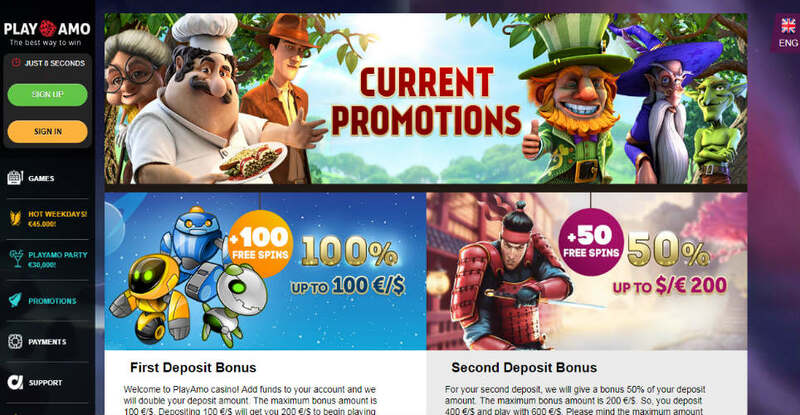 €200 Bonus + 50 Free Spins! 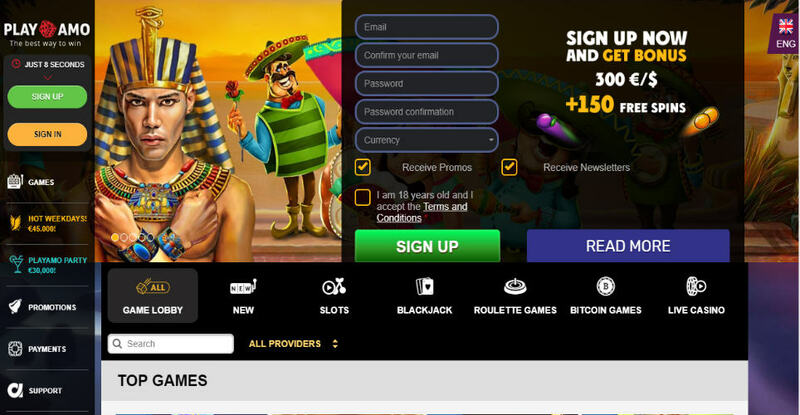 Brand new Bitcoin-operated Playamo online casino has appeared on the gambling market in 2016. In the first days of its existence, casino was able to appeal numerous customers because of having the perfect design, it is packed with the great amount of slot machines and classical casino games that will like even the sophisticated and experienced gamblers. Being the common gambling player and having the certain ambitions, at Playamo casino you will find everything that you need in order to start the successful game. 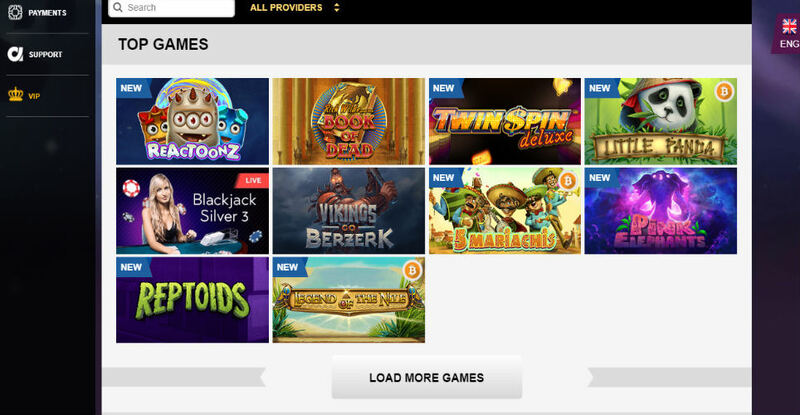 In fabulous collection of slot machines, you will find games from the giants of gambling industry as Microgaming, Betsoft, iSoftBet, Amatic, NetEnt and brand new Endorphina or Ezugi. Generally, you might enjoy playing around 600 slots and numerous casino games as Roulette, Baccarat, Videopoker, Blackjack online or even Keno. If you are looking for way to alive the gaming emotions or gain new experience, cast an eye at table games with live dealers. For each Bonus there is the standard requirement as x50 wager. Moreover, Playamo casino does not recommend making bets highly than 0.025 BTC for the spin or gaming round at any available game. In spite of the fact that Playamo is firstly Bitcoin casino, but crypto currency is one of the available ways to deposit the gaming balance. Thanks to the Cubits platforms you are able to deposit, withdraw and play in Bitcoins. There is some 0,2% fee for depositing and winnings withdrawing. Interestingly that the transactions of other payment methods are absolutely free except for Qiwi – 2,5% for depositing. Nevertheless, the digital currency is the most reasonable variant, essentially thanks for the anonymity of the personal information and instant transactions. The available payments methods are credit cards (Visa, Master card, Maestro), e-wallets (Skrill, Neteller), wire transfer (Sofort), Qiwi, Trustly and Cubits (Bitcoin). With the help of Visa, Skrill, Neteller, Sofort, Cubits and Comeplay you are going to withdraw your wins. Pay attention to the fact that processing time for Visa and Sofort is from 1 to 3 working days. Both newcomers and professional gamblers have to know that the max limit of withdrawing is $€4000 and min is $€20. When it comes to Bitcoins, the min sum includes 50 mBTC and max up to 10BTC per week.